The recent interest and funding to build homeless housing with supportive services has resulted in many questioning what the most effective building and service partnerships which should be formed. I’d like to share what I believe. Long ago, when community groups providing supportive services reached out to housing developers to house our clients, we helped each other gain new skills. Service agencies learned about housing development, and housing developers learned about needs beyond a place to live. The partnerships strengthened each, and a significant number of our homeless community were helped into stability and housing. Those fleeing domestic violence, being flushed out of state mental hospitals, and struggling with addictions received new hope. But while the joint development of housing was certainly a bold and successful addition to our community’s assets, it was the recognition that forming a supportive community of those sharing the journey that made the lasting impact. Remembering that most of those being targeted had only limited experience alone on the streets, our solutions were focused on fulfilling their desire to transition to traditional family housing lifestyles. Even so, success was greatly dependent on how effectively we helped build a new intentional supportive community around them. In the interim, those left behind in our efforts have built communities of their own anywhere they could. 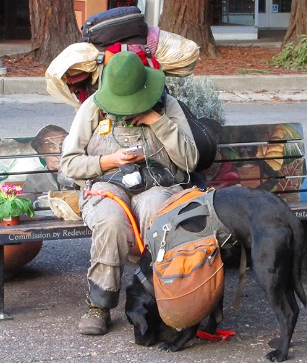 Our unwillingness to push beyond the socially acceptable homeless has not deterred those out early and pushed out consistently from turning their anger and resourcefulness into survival strategies. The failures of our society to deliver the basic components of upward mobility to most of our citizens has soured many of them on whether it will ever be so. In the work we will face over the next two months to create a county response to the millions of dollars being offered by the state for homeless supportive housing, we need to talk about what the housing and supportive services which are needed by the long-term, un-housed homeless. Experienced in living in shelters, vacant houses, buildings, tents, sleeping bags, and shadows – we need to work with them to learn what they need to build stability and a willingness to reach out to us. We need to also recognize that this new group of long-term homeless may only be able to transition if the route is through small communities that give each other support. Many of those small communities have been cobbled together using less thsn traditional housing models, and the supportive services provided to each other are not available through existing housing designs. Those of us who aspire to bring about new resources which meet the needs that are defined need to commit strongly to work together. We need to re-imagine both what supportive services and homeless housing are, and our roles in bringing it about. I am dedicated to bringing an open mind to that work, and I invite others to join with me in doing so. 1) Bruce Pearson is going to canvass Mercury Way at some point tomorrow. If you have a few hours, it would be great for him to have a partner. Also, some of those who got our notice who will come looking for a way to return the completed form or pick up blank ones. Call me 795-2890. 2) Consider becoming a "Buddy" with one person next week, to help them get their home/vehicle smog-ed, registered (and repaired if necessary). Call me 795-2890. As many of you know, on Monday morning we got word that the police were in the R.V. area off Corporate Center Parkway with tow trucks. Homeless Action! people put a sign on the door of our usual Monday meeting and joined the CAC people who'd come out to help. They towed a van, Sara's PT Cruiser and one other vehicle. Albert B. was woken up by a cop who said his van would be towed as soon as the tow truck arrived. He had less than 40 minutes to gather his things by the side of the road. Gregory, Gail, Bruce, Michael T., Victoria, Eileen, Colleen, Thomas, Anita, Adrian S. and I supported people, did legal observing and whatever else we could do to help. Kathleen called the Press Democrat repeatedly until she reached a reporter. We gave Albert support all the way to making up his bed at Sam Jones -- getting some of his property back along the way. We also continued work on a survey of those who are living there. Someone made a video. Would you please "reply all" to this email and send us a link? Many people have left the area. Gregory, Julie Combs, Jack Tibbetts and Jennielynn Holmes all talked to "People Who Decide" about leaving the residents alone as long as they are working with us on their registration and/or working with the HOST people through Coordinated Entry. On Monday afternoon, we knew that we will have a donor for $15,000 toward registering and getting many of vehicles up and running. That was very energizing. We particularly want to save the R.V. 's and Trailers which make a home for many of these folks. We began offering a Request for Funding form. So far, 25 people have filled out the Request Forms. It's likely we'll have more than 30 by the end of the week. We are going up and down the streets, usually in pairs, and talking to people one by one, and filling out the forms. We've done all the streets but one. No one was towed today. We've begun putting the attached sign on special orange paper on the vehicles who have filled out their Request for Funding forms and are working with us on their registration. But, we have no agreement from the SRPD that they will honor this sign. There's a meeting on Thursday at 2 pm among "People Who Decide" about what do to. Capt. Craig Schwartz is in charge of the police actions. This is why I asked you to "Buddy Up" with one person to help them get their home/vehicle smog-ed and registered (and repaired if necessary) If each of us takes one person, we can do this smoothly and quickly, with joy and happiness for all. There are a lot of stories and much hardship. I'd like to tell you about some of the people I talked with today but I think it's better to protect their privacy. Any of you who have done interviews at any of the camps know how your heart both opens and breaks as you talk with people. The article tone illustrates the inanity of leaning enthusiastically into the one homelessness statistic that is looked at by far the most by government. We have no clue from that number, or from anything the article says or shows in its cool graphs, whether these Seattle shelter and village programs are saintly or destructive. 1. Our homelessness programs aren't primarily rated on customer satisfaction, or stability provided (however we define giving shelter, safety, consistency, physical health, or access to services.) No service outcomes hit the top evaluative indicators. Not even key metrics on housing preparedness, or job or drug or credit or child reunion success, or mental health. Set aside the difficulty of gathering good metrics a moment, an understandable and constant problem in human services. Stats of people "exiting" to "permanent housing" are gamed. The games are rarely discussed, because they are revealing, and most parties involved are motivated subtly by self-interest and inertia and politics to overlook various bits of bad or embarrassing throughput. So, instead of struggling with the family of statistics that we need to measure usefully the complex processes of qualifying for, finding, winning, and then keeping permanent housing, we gloss and dumb down and game it. One number, exits to permanent housing, rules all. Our friends are shoved in motels for three days, and then thrown out– but not before they can be counted as a success. People are thrown in shelters and then thrown out for statistical purposes. They visit their mom or their tribe for a week- cured permanently of homelessness!- and return to the street. People go into one-month programs, 6 month programs, 2 year programs, and are permanent successes, as they make marks on the wall, counting the days that remain. People hit the max time at their only option for shelter and get kicked out; they get kicked out of other programs, or they walk;; they get kicked out of supposedly "permanent" housing, out of villages, out of shelters. They fall off the statistical ends-of-the-earth, the Artist Formerly Known as a Success, sometimes because the system needs to foist a new someone as a success in their place. People "refuse" to accept housing, victims of tricks of procedure, or language, or labyrinthine skits that avoid reasonable accommodation of disabilities. Think about those leaks in the system. We don't know what "exit to permanent housing" means. We know that permanent housing usually doesn't last long, but we don't know much about the averages, or the reasons for variation, or what to do about it. The sin isn't that we don't know those things– they are hard things to know. It's that we pretend we don't have to know, that we just need one number to judge success. Let's move on to the arcane kingdom of "transition". The doublespeak conventions of Housing First force us to talk about transitional housing that can't transition to much more than the system leaks denoted above, because there's little to transition to. We stand around like we're in a gulag in Soviet Russia, practiced at mouthing lies, turning these simple statistical dumbdowns over and over in our hands, pretending together, cluck-clucking about how some transitional programs aren't getting people into permanent housing well. We do this because we literally have nothing else to talk about. All that matters is that one number. The pertinent information, about the pipelines and bottlenecks to housing, are hidden, obfuscated, or downplayed for political purposes. Transitional small homes and communities are the only housing that can be rapidly developed, the only realistic hope for most of getting out of the cold and abuse until many years from now. Such homes can be as permanent and safe as any renter's lease, as well-built and long-lasting as our sense of charity allows. They can save lives and minds while we wait for an uncaring world to right itself. Yet villages are a foster child we keep manacled in a back room. We get funding, murmur about emergencies, then shun and dismiss villages as unworthy. The pogroms continue on the street, in twos and threes and tens. As a team, let's please take the time to refute in our minds the points in the article, and get used to doing so, so we can clearly and cleanly name the distorted mindset we are enduring. "...[nonprofits are] protesting how “exits” are being calculated after a recent change in methodology. Their concern is that they are being penalized for people who spend nights in shelter whom they cannot immediately move into stable housing, or who decline offers of help [typically for good, albeit unintuitive, reasons] ...Even when shelter clients are mentally, physically and financially ready to move into housing, there often isn’t a place for them to go, Giovengo said. More than 8,300 households are on the county’s centralized intake list for homeless housing." We can't let the kind of critical, gossipy, and simplistic dialogue of most of this article go on locally. So much propaganda and obfuscation is tolerated by everyone, feeding our officials' and the public's abuses. Pretending that the mission of the Continuum of Care is solely 1) build permanent housing, 2) 6 month human warehousing, and then 3) managing the emergency room expense fallout, is what has created this cynical merry-go-round of ours. This map contains information we have assembled on parcels of land that seem possible for housing developments. By housing developments, we are suggesting the broadest possible range of habitations, as the parcel sizes and location vary. There are three layers of sites now, and it is intended that the map be used for other useful information. The City's Housing element is required to identify the parcels that the City believes can be developed for affordable housing, and we will include those sites for our monitoring. Using the map, together with the City's Planning Department GIS system, it is possible to learn quite a lot about a property. We will also be including our comments on each site to identify movement toward development. There is a need to identify, follow, and stimulate the use of land in our City to provide the range of housing which meets the needs of everyone. Trying to create one map which could be used for the entire range of housing models (tents, tough sheds, tiny home villages, modular villages, as well as the range of more traditional housing for sale and ownership models - may prove difficult. But we're going to go for it. And it will only improve if you find the information valuable, and you help us keep if accurate and timely.